The recipe below has just three ingredients and comes together very quickly. I find that the cookies keep for up to a month (even two!) stored in an airtight container kept in a cool spot on the counter. Preheat the oven to 300 F. Line a baking sheet with parchment or silpat. Cream together the butter and sugar until evenly combined. Mix in the flour. The mixture might be crumbly– knead by hand until it comes together to form a smooth dough. Roll out the dough on a lightly floured surface until it is 1/4 to 1/8 inch thick. Cut it into 2-inch pieces, either using a cookie cutter, or slicing it into rectangles with a knife or pizza cutter. Transfer the cookies to the baking sheet, placing them at least one inch apart. 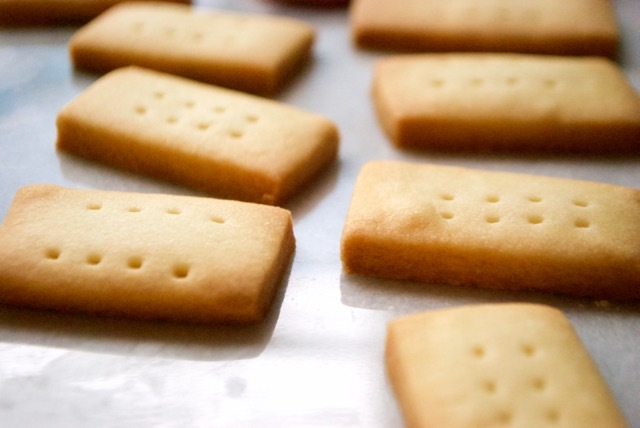 Prick the cookies with a fork, to prevent the shortbread from bubbling or puffing up during baking. Bake at 300 F for 15-20 minutes, until the cookies are a light golden brown. Store in an airtight container in a cool location for up to two months. Recipe adapted from King Arthur Flour (https://www.kingarthurflour.com/recipes/shortbread-recipe).